← 10 days until The Giant’s Shoulders #12! It is one of the quirks of scientific progress that many great experiments are forgotten as the things they demonstrate become common knowledge in the scientific community. A good example of this is the 1890 experiment of Otto Wiener, which I blogged about as my very first “official” science history post. Wiener constructed a beautiful experiment to demonstrate that it is the electric field, not the magnetic field, which is the “active” ingredient in light. Nowadays, this observation is just taken for granted, and relatively few books discuss the experiment which proved it. This is not an injustice, though, as much as an expedience: certain physical phenomena can be understood perfectly well without going into the historical origins of the discovery, and physics students have plenty of much more relevant topics to worry about. Nevertheless, there’s a lot of interesting work that isn’t talked about much anymore. December 22, 1895 photograph of Anna Röntgen’s hand. Röntgen originally called his mysterious new emanations X-rays, for lack of a better term. Though this is still the name most used today, they were for a period of time also known as Röntgen rays. Type of tube with which Röntgen discovered X-rays. The cathode rays impinged upon the broad end of the tube. From G.W.C. Kaye, X-rays (1918, Longmans, Green and Co., London, 3rd ed.). In an evacuated tube, a large potential difference is set up between the cathode and anode. 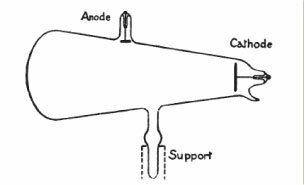 Electrons are pulled from the cathode towards the anode. Without any air molecules to slow them down, they accelerate to quite high speeds. When they collide with the anode or the side of the tube, their rapid deceleration results in X-ray production in a process known as Bremsstrahlung. Those who read this blog regularly will note that this is essentially the same situation which allows X-rays to be generated by peeling Scotch tape. A Cossor bulb with automatic softening device and fin radiator for cooling anticathode. Adapted from G.W.C. Kaye, X-rays (1918, Longmans, Green and Co., London, 3rd ed.). 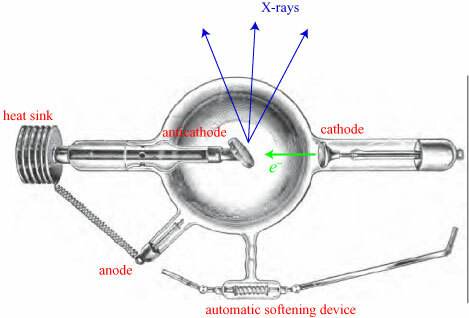 The original anode of the standard cathode ray tube has been replaced by an “anticathode”, which serves as a target for the impinging electrons and the source of the X-rays; a secondary anode is present which evidently improves the stability and lifetime of the tube. The anticathode gets heated tremendously by the electrons, potentially damaging it, so a heat sink is connected. The ‘automatic softening device’ regulates the pressure in the vacuum tube: more/less vacuum results in more/less energetic X-rays. Graph showing distribution of X-rays, the cathode rays being normally incident on an anticathode. From G.W.C. Kaye, X-rays (1918, Longmans, Green and Co., London, 3rd ed.). For those not familiar with such polar diagrams, the relative intensity of X-rays measured at a particular angle, say 40º, can be found by looking at the distance from the center of the plot to the point where the dark curve intersects the line to the 40º mark. The practical usefulness of X-rays seems to have been immediately apparent to most researchers. However, the physical nature of X-rays was not so clear. Were they a new form of particle? A new form of wave? Or another manifestation of electromagnetic waves? Röntgen showed, and the observation has been confirmed by very many subsequent experimenters, that the rays are not bent when going from one medium to another, and therefore that they suffer no deviation after passing through a solid prism. We have seen (p. 258) that Röntgen rays when they strike against a solid, a liquid, or even a gas, generate secondary rays which in the case of impact against a solid or a liquid are of a much less penetrating character than the incident ones; the incidence of Röntgen rays on the surface of a solid will therefore give rise to radiation proceeding from the surface; by far the greater part of this ‘reflected’ radiation is diffuse, i.e. though the incident rays are all travelling in one direction, the ‘reflected’ rays will spread out in all directions. 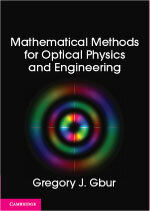 Many experiments have been made to test whether, as in the case of light, there are both inside and outside the boundary of the shadows cast by very small objects, variations in the intensity of the rays corresponding to the well-known diffraction fringes. Röntgen, who investigated this point, was never able to satisfy himself that the effects he obtained were undoubtedly due to diffraction. In other words: 1. Unlike light, X-rays did not seem to be refracted when entering a material surface. 2. Unlike light, X-rays are reflected diffusely at a surface, instead of being reflected in a single direction. 3. Unlike light, X-rays did not seem to experience diffraction. In hindsight, we can see why. 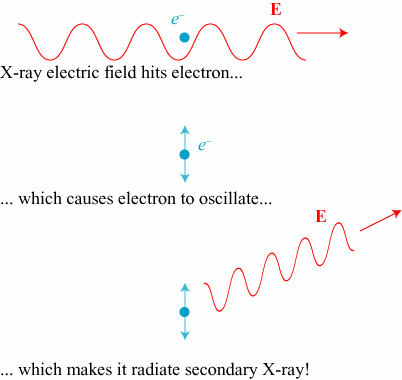 Looking at X-rays and visible light from a particle (photon) point of view: X-ray photons have energies which range from 120 eV (electron volts) to 120 keV (thousand electron volts), while visible light photons have energies on the order of a single electron volt. This energy difference makes a big difference in the way the photons interact with matter: atoms and molecules typically interact most strongly with photons which match their own characteristic energy. This characteristic energy is much closer to the visible light energy than the X-ray energy. The net result is that visible light interacts with matter mostly like a wave, whereas X-rays tend to interact with matter very much like little bullets shooting straight through the body (which is why they’re so good for imaging). No evidence of any polarisation of the rays has been obtained; the opacity of two crystals of tourmaline or of herapathite, placed one on the top of the other, is the same when the axes of the crystals are crossed as when they are parallel. The X-rays produced by a tube are generally unpolarized; i.e. they contain a combination of horizontally and vertically polarized rays. In order to detect polarization, one must first isolate one of these components. However, the “bullet” nature of X-rays makes them shoot straight through ordinary polarizers without noticeable effect. 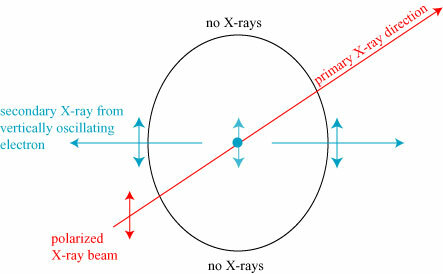 Ordinary light waves can be polarized by reflecting from a surface at Brewster’s angle; however, as we have noted, X-rays do not reflect normally at a surface and instead scatter in all directions. As of 1903, researchers strongly suspected that X-rays were electromagnetic waves, but had no evidence to demonstrate this. At that same time, however, British researcher Charles Barkla (1877-1944) (No relation to the basketball star) was performing experiments upon the phenomenon of secondary X-ray radiation. Since the discovery of X-rays, researchers had realized that X-rays passing through a volume of gas produce secondary, weaker, X-rays which propagate in many directions. 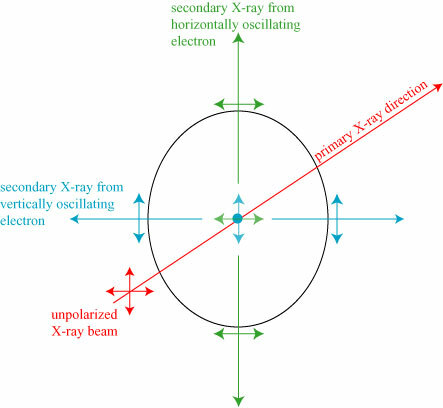 One of Barkla’s colleagues, a Professor Wilberforce, suggested the following method to test if X-rays can be polarized: take a primary (unpolarized) source, generate a beam of secondary radiation which is now in principle perfectly polarized. Generating tertiary radiation from a beam of secondary radiation, one should see that the intensity of the tertiary radiation varies from a maximum to zero for a range of directions around the secondary beam direction. The problem: secondary radiation is very feeble, and difficult to measure. A tertiary beam would be even weaker still, and almost impossible to measure. What was really needed was a primary beam of radiation which was already polarized. A consideration of the method of production of X-rays, however, leads one to expect partial polarization from the anticathode in a direction perpendicular to the axis of the kathode stream. For the electrons being projected in approximately parallel straight lines from the kathode to the antikathode, there is probably at the antikathode a greater acceleration along the line of propagation of the kathode rays than in a direction at right angles, consequently in a beam of X-rays proceeding in a direction perpendicular to that of the kathode stream it might reasonably be expected there would be greater electric intensity parallel to the stream than in a direction at right angles to that. 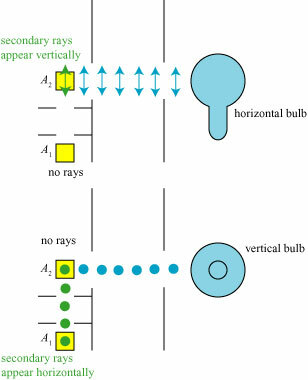 The X-ray bulb, D, emanates rays in all directions. Those which are horizontal and, by hypothesis, horizontally polarized, pass through a pair of apertures in screens and . After the apertures, most of the primary beam passes to electroscope B; however, secondary radiation is created by scattering from air. Radiation which passes horizontally (downward in the figure) is collimated by another pair of apertures and can be detected by electroscope . Radiation which passes vertically (into the figure) is collimated by other apertures and can be detected by electroscope . The electroscopes used for detection are worth mentioning. The X-rays were in fact indirectly identified by their ionization properties: X-rays ionize the air they pass through, and that electric charge can be detected by a specially designed gold leaf electroscope. As the bulb was rotated round the axis of the primary beam there was, of course, no change in the intensity of primary radiation in that direction. There was, however, a considerable change in the intensity of secondary radiation in both the horizontal and vertical directions, one reaching a maximum when the other attained a minimum. By turning the bulb through a right angle the electroscope which had previously indicated a maximum of intensity indicated a minimum, and vice versa. The position of the bulb when the vertical secondary beam attained a maximum of intensity and the horizontal secondary beam a minimum was that in which the kathode stream was horizontal, the maximum and minimum being reversed when the kathode stream was vertical. By turning the bulb through another right angle, so that the kathode stream was again horizontal but in the opposite direction to that in the other horizontal position, the maximum and minimum were attained as before. Undoubtedly the strongest evidence — up to the present time — of the similarity of nature of light and X-rays was supplied by the discovery of a form of polarisation of the latter rays. 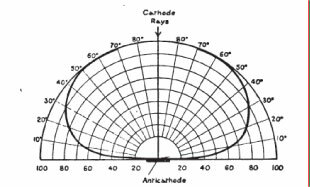 Barkla showed that the X-rays issuing from a bulb and impinging upon matter were less scattered by the matter in a direction parallel to the stream of cathode rays in the bulb than in directions at right angles to the stream. 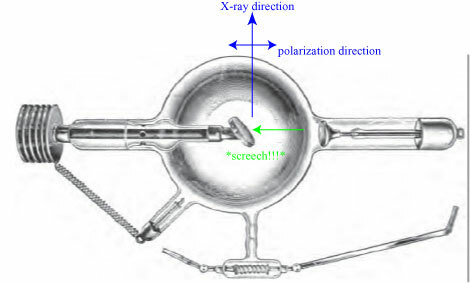 One doesn’t hear about Barkla’s clever experiment to detect the polarization of X-rays in any modern physics class. It’s easy to forget that many of the results that we now take for granted in fact took quite a bit of effort and ingenuity to uncover! 1 It’s times like this I’m glad I’ve done all those “basics” posts! 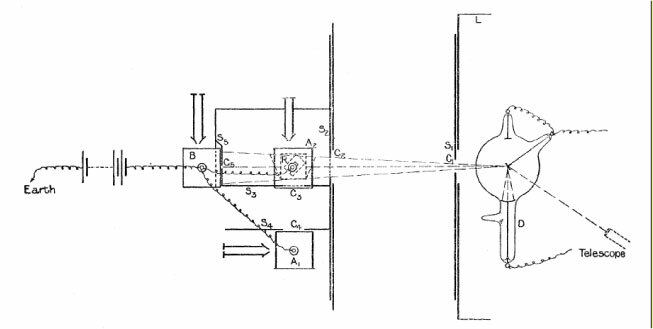 2 C. Barkla, “Polarisation in Röntgen rays,” Nature 69 (1904), 463. 3 C. Barkla, “Polarized Röntgen radiation,” Phil. Trans. Roy. Soc. Lond. A 204 (1905), 467. Another great post! I wasn’t aware of this experiment before reading it here. I can totally understand why they leave this sort of thing out of most textbooks, because otherwise it would take too long to teach the material. But an unfortunate side effect is that the non-specialist public (who may have had one or two science courses in college, but never went back afterwards to look up all these experiments) are largely unaware of how much experimental evidence there is for the things in science textbooks. Perhaps it would help if if introductory science classes concentrated more on this kind of experimental evidence, and less on teaching the distilled end results without any supporting information. 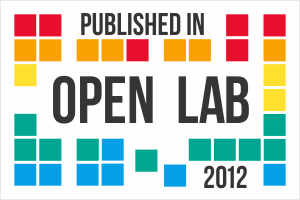 Maybe a “ten greatest experiments in science” approach, instead of the “ten greatest ideas in science”? P.S. I’m interested to hear more about your textbook… what will the subjet be? Wade: Thanks for the comment! I’ve been thinking about putting together some sort of class about “classic experiments in science”, though I haven’t had the time as yet to do it. I think it would be helpful, especially because it could give students a better feeling for how scientific discoveries are made. I’ll reveal a bit more about my textbook in a couple of months… until I get the first draft done, I don’t want to talk about it too much! A really nice post. I would like to make a suggestion. I would like to make it clear that the article is excellent. This is the only bit I noticed could be phrased better. I guess you mean that tubes of this design can only produce X-rays up to 120 keV. For diagnostic radiology tubes have a maximum around 150keV (for reasons of usefulness, contrast decreases at higher energies due to the change from photoelectric to Compton interactions). For superficial X-ray therapy, there are “orthovoltage” machines that go up to around 500keV. Once you start to use linear accelerators, it is common to use 15MV X-ray beams (15MeV max energy, modal energy around 5MeV). This is currently common around the world for treating prostate cancer, for example. Once you look into astronomy, X-ray photon energies can, of course, get even wilder. The reason I think it is worth noting this is that it is a common misconception that some sort of useful distinction between types of photons (gamma, X-ray, …) can be made based on energy. When usually it is the mode of production that is the most important difference. Random but interesting digression: it seems that Nikola Tesla may have actually taken the true first X-Ray photographs. However, as occurred sadly often with him, he didn’t really think much of it, since it wasn’t his main interest at the time. When Röntgen announced the discovery of X-Rays, Telsa was able to dig up his photographic plates that predated Röntgen’s by several years. Of course, it’s something of a moot point. The reason we give Röntgen credit is that he realised the significance of his discovery and shared it with the world, unlike the rather secretive Tesla. Joshua: Interesting! You’re right, though; Röntgen gets full credit for not only observing the effect but studying it in detail and bringing it to the world. A similar thing happened with Rutherford vs. Perrin: Perrin apparently was the first to suggest the atom might be of a ‘nucleo-planetary’ form, but he never developed the idea. Rutherford, of course, independently came up with the idea after the famous gold foil experiment. I came across this while trying to find out whether X-rays are circularly-polarized radiation (like gamma rays are, I believe) or plane-polarized radiation, or elliptically-polarized radiation. I learned that they are usually unpolarized, a mixture of plane-polarized radiation containing all possible orientations of the plane of polarization. I expect that the manner of generation of the radiation determines which type of polarization is present. Physicists consider that the “elementary” photon is circularly-polarized. I’ve never seen a discussion of why, but I suspect it stems from the fact that the Poynting vector (the magnitude of which measures the magnitude of the energy transmitted, and the direction of which determines the direction of transmission of the energy) has a magnitude that does not vary with time only for circularly-polarized radiation; for plane-polarized radiation, the magnitude of the Poynting vector oscillates sinusoidally with time around a mean value that is the constant value that the otherwise identical circularly-polarized radiation would have. Physicists like the idea that electromagnetic radiation has a characteristic energy value determined by its frequency; the circularly-polarized version behaves like this. I wonder why he used air as scatterer, because the scattering of X-rays in air is very small. It is surprising that he could detect it with those means. Wouldn’t it be easier with a liquid or an amorphous solid as scattering media? I also wonder what is the grade of polarization of the primary beam. Right or wrong, in the field of radiation protection, medical physics, etc it is always assumed that polarization effects in ordinary X-rays are totally negligible in practice. Thanks for the comment, and apologies for the delay in replying! Not entirely sure why gas was used instead of a liquid or amorphous solid, though apparently he had only observed the secondary rays for gases and “certain solids.” It may simply have been that the scattering of x-rays in air is mostly elastic, as he notes that the secondary radiation “differs little in character” from the primary. Not an expert on x-ray tubes, but my impression is that the amount of x-rays coming off of the anode perpendicular to the electron motion is very small. I’m guessing that most sources don’t employ this direction of radiation, and x-rays moving in the direction of the electron stream are unpolarized. I’m also guessing that the degree of polarization is pretty low, thanks to the very crude manner of production. Diagnostic X-Ray tubes use electrons up to around 150keV. These tubes produce X-Rays at 90 degrees to the incomings electrons. I think this is because X-Rays produced in-line with the electron beam tend to get attenuated by the anode again. Most efficient way is to produce them at 90 degrees. The anode angle may vary depending on what the tube is for (mammography tubes are a bit different, I think). Once you get up to linacs (electrons 4Mev-25MeV) for therapy the x-rays are produced in line with the incoming electrons.